The Awesome Aquifer Kit is a fun, hands-on way to get students to "see" groundwater. The kit includes lessons to build a groundwater model and learn about groundwater terminology, groundwater's role in the hydrologic cycle, the physical makeup of an aquifer, groundwater contamination, and more. Purchase your own kit from The Groundwater Foundation's online catalog. This step-by-step visual guide will walk you through model building basics. Start your groundwater research here! Find links to a variety of links to more information about groundwater and model-building. The Hydrogeology Challenge is a learning tool that introduces students to basic groundwater modeling concepts. This 10-minute video will take you step-by-step through running the Hydrogeology Challenge. 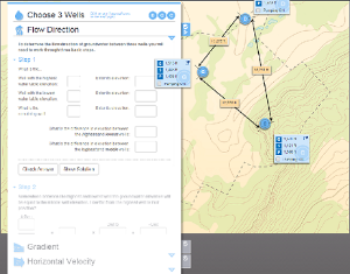 Printable instructions on how to use the Hydrogeology Challenge program as well as suggestions and tools to help you easily integrate it into your class. Use this table to study common groundwater contaminants. A jointly developed guide to techniques and technologies for soil, groundwater, and surface water remediation. 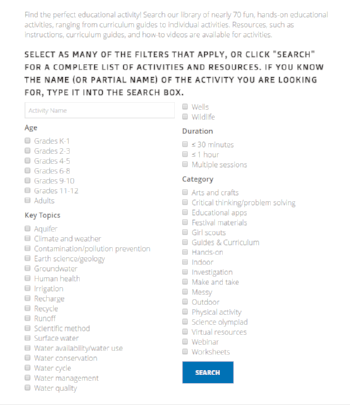 Search for the perfect groundwater activity across multiple criteria - key topic, age range, duration, and category. Find instructions for our most downloaded activities - Awesome Aquifers, Frannie the Fish, Edible Aquifers, Growing with Groundwater, and more.